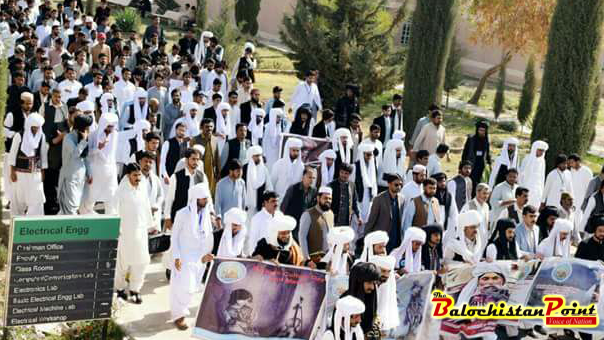 A cultural walk was arranged by the Baloch Students Action Committee (BSAC) and Students Action Committee. A large number of Students, faculty members, administrative officers including the Vice Chancellor wearing turbine and Balochi cultural dress participated. . Addressing the walk, The Vice Chancellor highlighted various features of Baloch culture and its history. “Culture celebration plays a key role in promotion of traditions of a nation. Nations give much importance to their cultures because nations are identified by their cultural traits, values and norms”, said Vice Chancellor. Moreover, he expressed his said that i am gladness to on organization of Cultural events, seminars, rallies and exhibitions which were arranged on this special day. “I feel pride and pleasure to be among the youth of Baloch on this cultural celebration day.” He added. 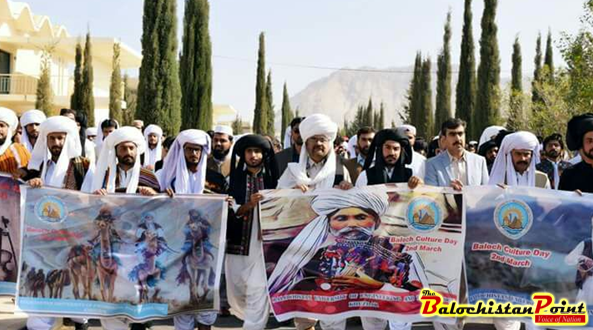 After successful walk, Students along with other staff members moved to Mir Ghos Bakhsh stadium Khuzdar to participate in various cultural activities as invited and arranged by the District administration Khuzdar.